Couple of months ago, I got an Apple Ipod Shuffle 4g. Despite the presence of IPod syncing apps under Linux, my experience was annoying. Shuffle 4g changed compared to its predecessors regarding the database format and new features, so a lot of plugins and apps don’t work as expected. In this post, I will write about different ways to tackle this annoyance. Bah! why can’t Apple make straightforward stuffs! Anyway, here are things you should know in a nutshell. IPod’s internal software works on a defined structure in the mass storage of the IPod. The process of creating this structure may be referred to as initializing your device. For adding any content to your device, a simple copy is not enough, changes need to be made in the database (The iTunesSD file) as well. This entry was posted in Linux, Linux and FLOSS and tagged 4g, ipod, Linux, playlist, rhythmbox, shuffle, voiceover on October 12, 2013 by nims11. I had been using Rhythmbox since a long time. It was perfect for me, with clean interface, synced well with my Phone, had Last.fm support and lyrics support. However, encountered Nightingale a day ago and completely fell in love with it to extent I am switching permanently to it. 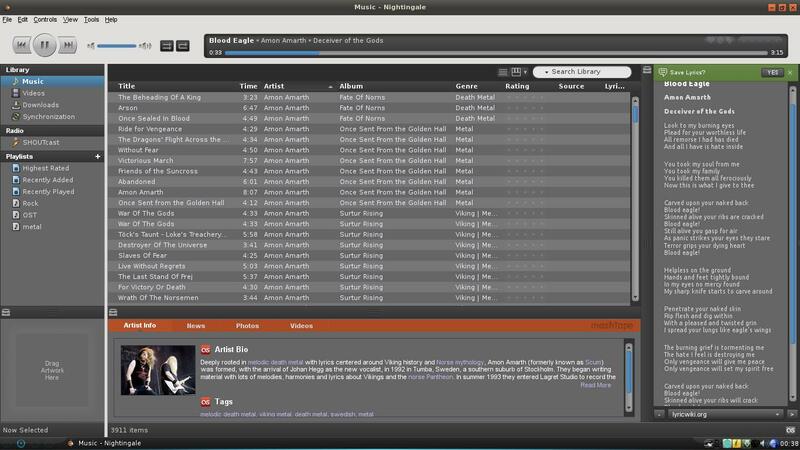 Nightingale forked off from Songbird, when it discontinued its support for Linux. My first reaction playing with Nightingale was, “Firefox modded into a music player?”. Nightingale’s engine is based on Mozilla’s XULRunner and Firefox users will feel home. UI: The first thing impressed me about Nightingale was its beautiful and sleek UI. Most music players with sleek and attractive UI usually have a trade off with functionality. And most players with too much functionality usually end up being ugly. Nightingale puts up lots of things in front of you while maintaining its beauty and simplicity. This entry was posted in Linux and FLOSS and tagged Linux, music, nightingale, player on July 25, 2013 by nims11.